Yep it's been a while. So anyway, these are the cards I made for Christmas this year. This first one I made with a freebie file from the Silhouette store. 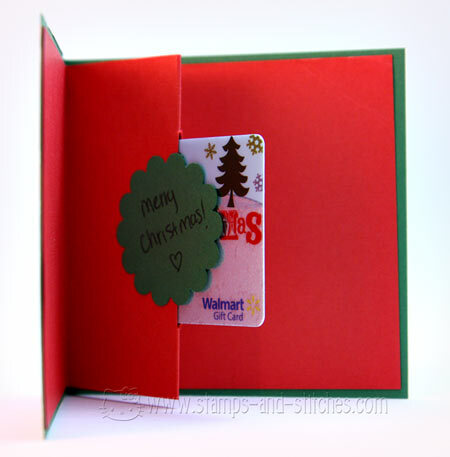 I used my new favorite embossing folder, which is the stars & swirls from Sizzix. 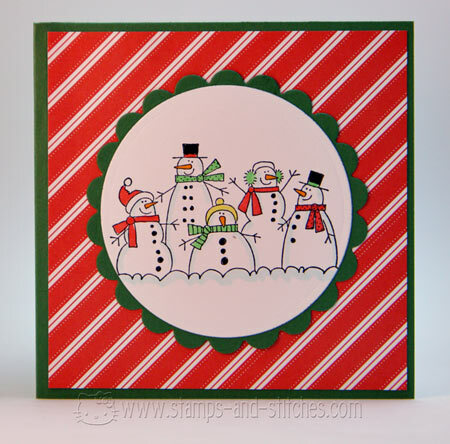 The baker's twine is Martha Stewart brand, the white card stock is Neenah and the red card stock and green patterned paper are both from Stampin' Up. The next one was made with a file from Lettering Delights and cut out with the Silhouette SD. The embossing folder is from the evil Provo Craft. 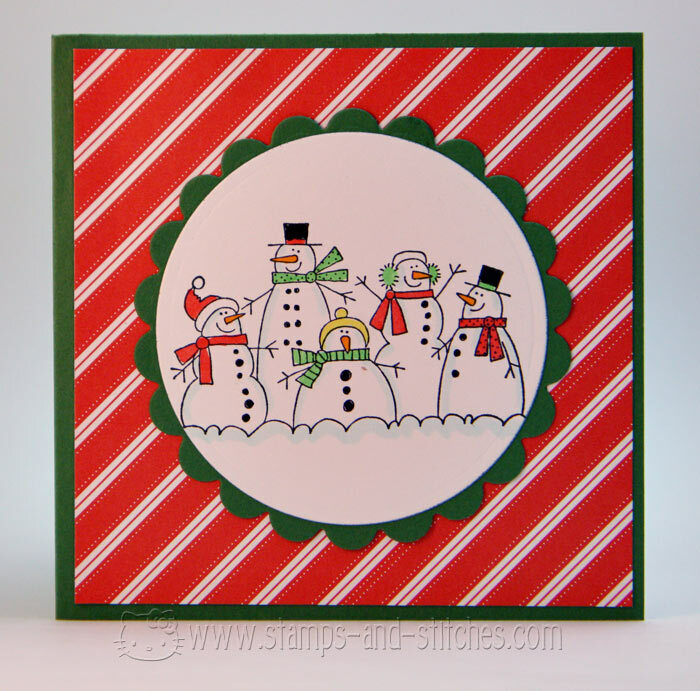 White card stock is Neenah and the rest of the card stock and the patterned paper is from Stampin' Up. This is almost all from Stampin' Up. The off white card stock is Bazzill, the border punch is Martha Stewart and the baker's twine is Divine Twine from Whisker Graphics. 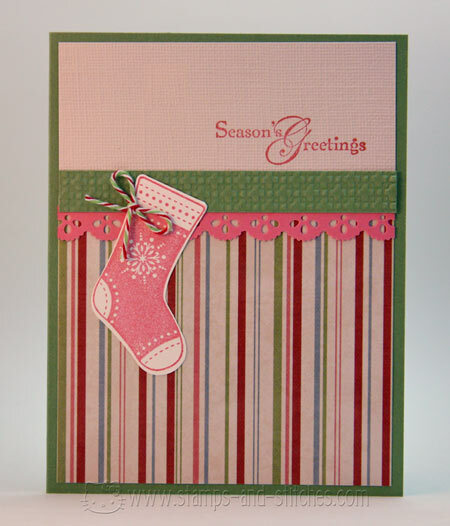 I cased this card from Wrestlermomx2 on Split Coast Stampers. Thanks Wrestlermomx2! This is a card I made to hold a gift card for my nephew. I used a tutorial from Jennifer McGuire. 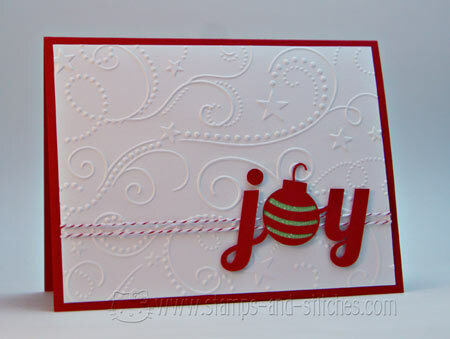 White card stock is Paper Trey Ink and colored card stock and stamp from Stampin' Up. I'm not sure about the patterned paper. The inside card stock is Bazzill. The image is stamped with memento ink and colored with copic markers. The inside scallop is from a Stampin' Up punch and the outside shapes were cut with nestabilities. Hi Gale!!!!!!!! Lovely to see you back in action. Gorgeous card and I hope you and your family had a wonderful Christmas. All the best for 2012, xox! These cards are very cute. I love the card with the little frog on it. I hope you all are doing well and that you had great holidays. Great Christmas cards! Love the gift card holder! fabu cards...i love the ef on the 1st one...gotta get it! Lots of wonderful Christmas cards. 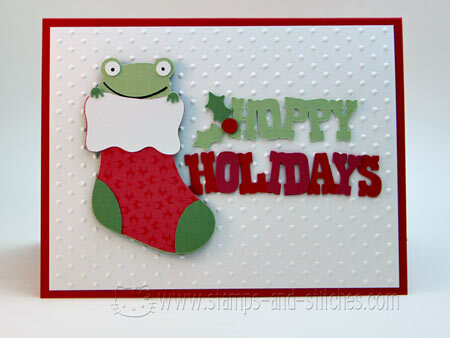 I love the stocking with the frog peeking out - so adorable! Thank you for sharing them with us. Yay Gale! So glad to see you back! You were so busy...I am impressed that you make your own Christmas cards! Mine are via Snapfish. LOL Happy New Year to you! All of your cards are wonderful. I love how elegant the first one looks. I think my favorite is the "hoppy holidays" one. One of my dearest friends loves frogs...she'd get a kick out of it.